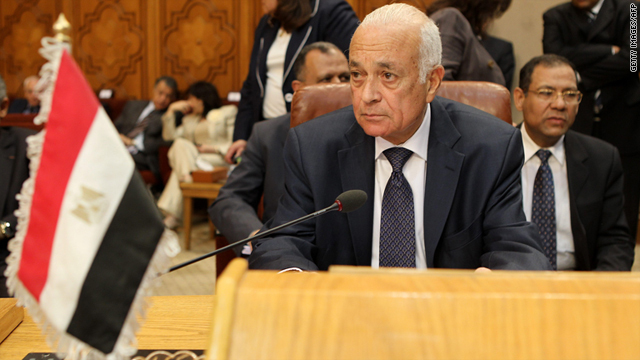 Nabil Al-Araby pictured at a meeting on May 15 in Cairo, Egypt, during which he was elected head of the Arab League. (CNN) -- Less than two months after being tapped for the position, Nabil Al-Araby has formally become the head of the Arab League, Egyptian state media reported Sunday. In his first comments since taking over as the alliance's secretary-general, Al-Araby acknowledged that the region's political landscape has changed significantly in recent months. He touched on a number of hot-button subjects in his interview with the state-run Al-Ahram news agency, including the hostilities in Libya and strife in Syria. Now that he is the Arab League's secretary-general, Al-Araby, 75, said he plans to order investigations into alleged human rights abuses perpetrated by forces loyal to Libyan leader Moammar Gadhafi. He also urged Syrian authorities to implement real reforms and transition to democracy. The former Egyptian foreign minister also weighed in on the plight of Palestinians, saying an independent Palestinian nation ought to be recognized and Israelis should pull out of Palestinian territory. Al-Araby was elected by Arab League representatives in May, after its then-leader Amre Moussa declared his intention to leave the post in order to run for president of Egypt. That country is in the midst of a major political transition following the ouster of longtime President Hosni Mubarak in February. A judge on the International Court of Justice between 2001 and 2006, Al-Araby joined the movement to unseat Mubarak's government early this year. He was one of six ministers sworn in last March by the head of Egypt's military, Mohammed Hussein Tantawi, to join the administration headed by Prime Minister Essam Sharaf. He replaced Ahmed Aboul Gheit, who had been foreign minister since 2004. Well before that, Al-Araby had established himself as a force in Egyptian as well as international politics. That includes several roles related to the United Nations, including as Egypt's representative in New York between 1991 and 1999, as well as a stint as the North African country's ambassador to India, according to the official Egyptian State Information Service. He has spoken to many groups over the years, including at the American Society of International Law, International Peace Institute, the Hague Academy of International Law, Columbia University and Duke University. Founded in 1945, the Arab League has 22 member states throughout North Africa and the Middle East. The Cairo-based alliance often takes stances, and sometimes takes action, related to issues affecting the region. CNN's Yasmin Amer contributed to this report.